Deal of the century or a fitting legacy? 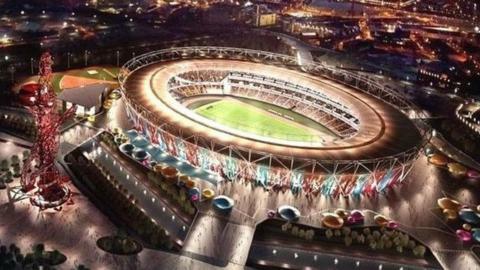 Whatever your view, West Ham's Olympic Stadium deal has got people talking. Critics believe the venue has been hived off on the cheap, while supporters say the move has stopped it becoming a waste of money. After a long-running legal battle, the full details of the contract were published on Thursday, and it makes for fascinating reading. In 207 pages, the finest details can be combed over, from what the Hammers pay if they win the Champions League to who funds the cleaners and pest control. How does the rent break down? At £2.5m a year, that's £100,000 a game - or £48,000 a week - for West Ham to use the 60,000-seater stadium for 25 matchdays annually. Should West Ham need to use the stadium more than 25 times, to fulfil cup games, or friendly matches, for example, then they will be charged £100,000 per game. The club will have a permanent presence at the venue, with a major club shop expected to have about 40 tills. All payments are inflation-linked to the Retail Price Index over the course of the deal, but in today's money, West Ham are paying a total of about £247.5m between 2016 and the year 2115. The deal factors in the performance of West Ham, currently sixth in the Premier League - just behind Manchester City and Manchester United. The better they do, the more they earn, so the more they pay. But if the east London club are relegated from the Premier League, their rent will be halved whichever division they are in - so it will be £1.25m annually should they drop into the Championship or lower. The figures West Ham have to pay based on performance are cumulative. So, for example, for a sixth-place finish the club would be required to pay stadium bosses, the London Legacy Development Corporation (LLDC), £275,000 - made up of £85,000 for sixth added to seventh, £70,000; eighth, £55,000; ninth, £40,000 and 10th, £25,000. And the goalposts and corner flags? Last year a BBC documentary revealed the club would not have to pay directly for a range of things including stewarding, goalposts, corner flags, cleaners and turnstile operators. Experts told the BBC that the value of those services would amount to between £1.4m and £2.5m a year depending on the size of the stadium. However, stadium bosses point out that this is normal for a rental agreement, using the analogy that you would not expect to hire a badminton court and not have nets supplied. The policing costs for London football matches are already covered by the Metropolitan Police - West Ham's bill came to more than £300,000 last season, while Chelsea topped £600,000. What have the costs been so far? Original plans for the stadium, in the era of London 2012 chief Lord Coe, mayor Ken Livingstone and sports minister Tessa Jowell, focused on athletics with a reduced capacity from 80,000 to 25,000. Football had not been factored in and converting it into the new home for the chosen bidder West Ham is costing £272m, meaning the overall spend tops £700m. Tottenham had expressed an interest, although some questioned whether this was partly as leverage for plans to redevelop their existing White Hart Lane home. Now officially the former Olympic Stadium, negotiations have been taking place over a naming rights partner - when Arsenal moved from Highbury, their ground became Emirates Stadium, while Manchester City play at Etihad Stadium after switching from Maine Road. City say they pay £4.9m a year to use the City of Manchester Stadium - an athletics venue for the 2002 Commonwealth Games - and paid £40m towards the conversion and fit-out costs. They took control of the naming rights, which was a proportion of what Abu Dhabi-based Etihad Airlines paid City £35m-a-year for when they agreed a wide-ranging 10-year-contract with the Sky Blues in 2011. For West Ham's east London venue, it has been revealed the first £4m each year of any naming rights deal will go to the LLDC and Newham borough, with anything above that between the two bodies and West Ham, although the amount is capped. As an example, in a hypothetical 10-year naming deal worth £50m, the LLDC would get £45m with West Ham receiving £5m. Whatever the name, the stadium will be a multi-use venue, in contrast to some Olympic sites from previous Games which are no longer in use. London has already hosted motorsport's Race of Champions and Rugby World Cup matches, has an AC-DC concert in the pipeline and will stage the World Athletics Championships and IPC World Championships next year. What are West Ham & stadium bosses saying? West Ham did not take part in the appeal against the Information Commissioner's ruling that the deal should be made public, and say they have nothing to hide. In a statement, the Hammers said: "People can now see that the full revenue streams from which the stadium's owners will benefit go well beyond the widely-reported payments we have committed to make to the transformation costs and our annual usage fee for using the stadium 25 days a year. "Those revenue streams include the contribution of the lion's share of the income deriving from the stadium's naming rights, catering, stadium tours, all non-matchday income and further substantial revenue if - as is our primary focus - the club continues to enjoy success on the pitch. "We firmly believe it is a great deal for both West Ham United and also the taxpayer." The club added: "Someone renting the stadium for 25 days a year cannot be responsible for 365 days' running costs." Earlier this year, it emerged the LLDC will have spent about £20,000 in legal fees trying to thwart publication of the contract, citing commercial sensitivities. "Our motivation in bringing this case has been to protect millions of pounds of taxpayers' money," it said. "The stadium needs to be a profitable and successful commercial operation otherwise it will rely on public subsidy. "We were concerned that the publication of this contract and the precedent it may set for future agreements could make it harder to do this." What if West Ham are sold? David Gold and David Sullivan bought West Ham seven years ago in a deal which valued the club at £105m. Gold, who once played for the Hammers youth team and lived in Green Street near the Boleyn Ground, has said the club were close to administration and they have reduced significant debts considerably. However, the contract does include a clause should control move away from their families. The LLDC would not receive a payment if the sale price was up to £125m, but anything above that and it could get anywhere between £9m and more than £90m, the figures rising incrementally depending on the purchase price. A coalition of 14 supporters' trusts from around the country submitted a Freedom of Information request to obtain the tenancy agreement and believe the deal gives West Ham, who have played at Upton Park since 1904, a competitive advantage. In a statement it said: "This is the right decision for the taxpayer, and the right decision for football." Barry Hearn, former chairman of Leyton Orient, tried unsuccessfully to get West Ham to groundshare with their near-neighbours. "The stadium cost £270m to convert, it cost nearly hundreds of millions to build and on the face of it West Ham got access to it for £15m, and are paying the equivalent of £100,000 a game," he told the BBC. "Frankly it was a hot potato that (current London mayor) Boris Johnson and the LLDC wanted to get rid of. They wanted to close a deal at any price and they will say - quite rightly - that's because we didn't have anyone else. "I think my dog could have negotiated a better deal on behalf of the taxpayer." (As an aside, Hearn says his mutt is called Harris - he is a mongrel rescue dog, described as a lurcher and ridgeback cross). Hearn has long suggested that West Ham are effectively benefiting from state aid, and this could breach European Commission rules. However, the commission found no basis to investigate further when a complaint along those lines was made last year. Taxpayers' Alliance: "You can't blame the club for taking advantage of the ludicrously generous taxpayer subsidy they've been handed on a plate. "Instead we should be directing our anger and awkward questions at those responsible for offering a deal for which most clubs would have sold their star striker. "Those of us footing the bills deserve a proper explanation." Negotiations clearly took place over a lengthy period and at a high level, and the final page contains the signatories. Karren Brady's, as vice-chairman of West Ham, is counter-signed by a trainee solicitor, whose name has been redacted. With many signatures required on various documents, this is not considered an unusual practice. What may be a surprise is that more than three years on, the fallout over the details continues.